For use with Bally and Williams "WPC-95" games made from approx. 1994-1999. Approx. 12 pages. 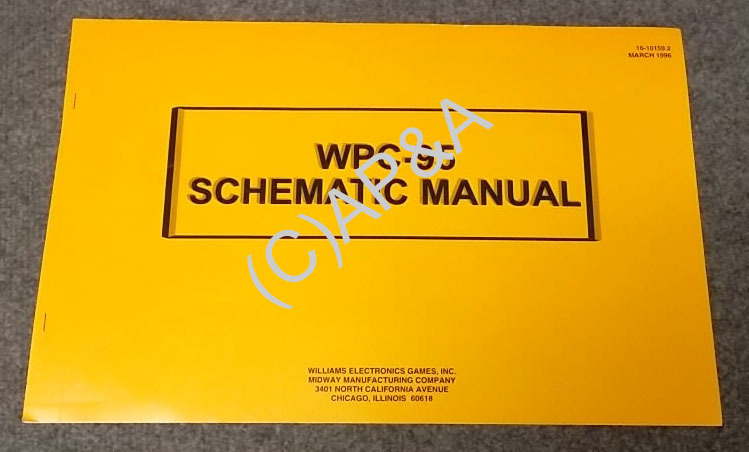 This is the manual that specifically covers the circuit boards, display unit, and power/transformer wiring in these games. Your actual game manual covers only the game-specific (playfield) circuit boards and wiring, but this manual covers the rest! Essential for any circuit board troubleshooting/repair, and a must to complete any WPC-95 game. Factory-original manual in new condition. Williams part # 16-10159.2 (orange manual, March 1996). Measures 11 x 17 inches.